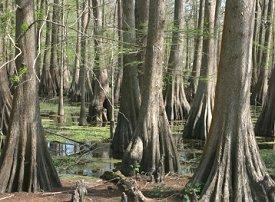 Cypress Gardens is named after cypress trees. Cypress Gardens theme park is an oasis of natural beauty and adventurous thrills in Winter Haven, Florida, just southwest of Orlando. Cypress Gardens first opened in 1936 as a botanical preserve with luxurious gardens watched over by a magnificent cypress tree. That tree and those gardens are still features of the park, but the rest of the attraction's landscape has changed significantly with changes in the tourism market in recent years. In April 2003, the park was closed due to declining tourism, but it was purchased in 2004 by Kent Buescher, the owner of Wild Adventures Theme Park in southern Georgia. Buescher added more rides and roller coasters to the park, giving it a broader appeal to families and visitors of all ages. Today, Cypress Gardens is a fun getaway for thousands of people each year. Cypress Gardens is more than just a botanical preserve - it is a true adventure park with beautiful landscaping, thrilling rides, exotic animals, and exciting entertainment everyone can enjoy. For decades, the park's meticulously maintained gardens were its main attraction, and today they offer visitors a wide range of beautiful vistas. Gardens are spread throughout the park's 35 acres and include herb, rose, and butterfly themes as well as the classically sculpted floral beds, elegant gazebo, and vibrant green lawns of Snively Plantation. The Topiary Trail is a popular attraction where guests can admire dozens of precisely designed shrubs and plants in dozens of whimsical shapes. With hundreds of native and exotic plants and flowers on display, many guests opt for the guided tours to not only see these stunning gardens, but also to learn about their care, the types of plants, and the conservation efforts that make the beautiful landscape possible. Galaxy Spin: This bright pink and yellow roller coaster features spinning cars twirling their way through two levels of hairpin turns. Starliner: This 70 foot tall classic wooden out-and-back roller coaster was moved from the now defunct Miracle Strip Amusement Park after it closed in 2004 and continues to give riders a thrill. Swamp Thing: A family-oriented inverted roller coaster, this ride gives young riders a taste of innovative coaster designs. Triple Hurricane: Named in deference to Florida's tempestuous climate, this family wooden coaster reaches speeds greater than 30 miles per hour along its dips and curves. Wave Runner: This zigzag water slide coaster is a fun way to cool off in the hot Florida sun and the tunnels keep riders guessing about the next wave. Boardwalk Carousel: This nostalgic double-decker carousel includes animals, chariots, and gondolas so everyone can indulge in the classic experience of a timeless merry-go-round. In addition to these large rides, Cypress Gardens is also home to a range of classic amusement park rides, such as a Tilt-a-Whirl, swings, Ferris wheel, and miniature railroad. Kids will especially appreciate the Bugsville kiddie area where small rides offer big thrills for young guests. Like its sister park in Georgia, Cypress Gardens is home to a number of unusual animal species, including a jaguar, crocodiles, alligators, wallabies, snakes, turtles, iguanas, white egrets, lemurs, and opossums. The Nature's Way region of the park also offers interactive animal attractions such as the Aviary where guests can feed brilliantly colored birds from cups of nectar and the Wings of Wonder butterfly open arboretum. In total, more than 300 species of birds, mammals, and reptiles reside at Cypress Gardens theme park. Good entertainment is an important feature of any amusement park, and Cypress Gardens guests can enjoy waterskiing demonstrations and trick shows on the adjacent Lake Eloise along with ice skating shows and lighthearted comedy routines at other venues. The park also hosts regular concerts featuring stars such as LeAnn Rimes, Travis Tritt, and Lonestar. To enhance the southern ambiance of the park, costumed Southern Belles stroll through the gardens and share culture and history with interested guests, and young visitors are welcome to join the Junior Belle program to choose their own southern attire and immerse themselves in the antebellum atmosphere (extra fees apply). The Cypress Belle paddle boat is another entertaining feature of the park. Guests can purchase tickets for short daytime cruises or longer dinner cruises to see Cypress Gardens from the unique perspective of being on the lake. Interested passengers should note, however, the paddleboat does require regular maintenance and may not always be operating. Located just an hour's drive from Orlando, Cypress Gardens is easy to visit and offers a number of ticket options for interested guests. Tickets to just the park's gardens are $13 for adults and $10 for children and senior citizens, while water park passes are $24 for adults and $18 for children and seniors. Combination, multi-day, and season passes are available.